1. Go in the baby's room and tell me if it's too hot. 3. Wash the pacifiers that fall on the ground constantly. 5. Keep the dogs from being sent to the pound, where I would have sent them two days ago when they woke Jack up and he screamed for 30 minutes. These are just some of the things he does to make my life easier. There are millions more. But the key is keeping him rested and well so we aren't both a complete mess. I didn't realize this huge importance until he got sick last week – it's taken us a week to get things back to normal! 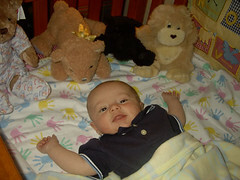 Jack spent the day at Grandma and Grandpa Adams house yesterday. He's usually not this smiley at home when I put him in the crib! 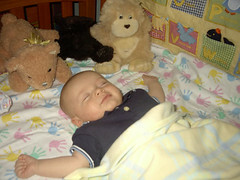 And even in his sleep, he's still smiling! 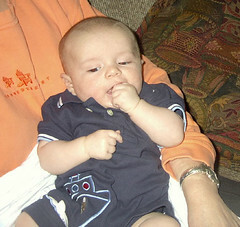 Jack's newest feature is sticking his entire fist in his mouth. All in all he had a great day with his grandparents, and I think they had fun with him too. When they dropped him off, Tom said "He's a little high maintenance!" I have to agree - he does take up a lot of time and energy, which is why it's so great I have places to drop him off for a bit of a rest! Today we're going up to visit my mom, and maybe I'll sneak in a nap there too! What did you do with your free time while Jack was with his grandparents? Did you do something really fun with someone really cool? Just curious.